Tokyo autonäitusele paneb Sups välja uue hübriidi. Kuna uks üles tõuseb, siis peaks just äkki parem olema - ei kraabi ja ei tao teisi autosid? Kui nüüd Mersu SLS võrdluseks võtta siis ega see uks ei saa väga suure kaarega kinni käia, muidu ei ulatuks ju kinni tõmbama. * 2013 Subaru Coupe: This coupe is being jointly developed with Toyota and will use Subaru's boxer engines. The Toyota FT-86 concept introduced at the 2009 Tokyo Auto Show is a good approximation of what Toyota's version of the rear-wheel-drive sport coupe will look like although some rumors suggest that a full redesign has been ordered. The Subaru version will likely get unique styling, but all the mechanical aspects of the two cars are expected to remain the same. * 2012 Subaru Forester: After a full redesign in 2009, the Subaru Forester will get a midcycle refresh for the 2012 model year. * 2011 Subaru Impreza: A revised Subaru Impreza WRX lineup was introduced at the 2010 New York Auto Show. Standard WRX models received enhanced bodywork similar to the STI models, while the actual WRX STI models received numerous suspension enhancements to further improve handling. A sedan body style was also added to the lineup. * 2013 Subaru Impreza: An all-new Subaru Impreza is expected to arrive in late 2012. In addition to the usual design changes, this Impreza could make headlines by introducing the company's first hybrid drivetrain. 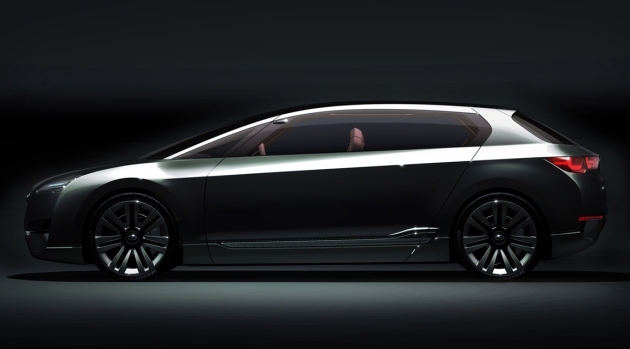 A concept vehicle called the Hybrid Tourer was introduced at the 2009 Tokyo Auto Show and at the time Subaru officials said to expect a production hybrid drivetrain by 2012. * 2013 Subaru Legacy: Redesigned from top to bottom for the 2010 model year, the Legacy isn't expected to get any significant changes until 2012. * 2013 Subaru Outback: Like the Legacy, the Subaru Outback was redesigned for 2010. Expect a round of midcycle updates in about two years' time. * 2012 Subaru Tribeca: After experiencing slow sales for several years now, it's questionable whether Subaru will choose to do a full redesign of the Tribeca. At the forthcoming 81st International Geneva Motor Show (1 to 13 March), Japanese manufacturer, Subaru, will be showcasing an exciting new concept vehicle. Making its world debut will be the Subaru ‘BOXER Sports Car Architecture’ Concept, currently under joint development with the Toyota Motor Corporation. This partnership with the world’s largest car manufacturer has proved hugely successful in bringing the project to fruition in a timely and cost-effective manner. Based on an all-new platform and highlighting Subaru’s new design direction, the vehicle boasts the brand’s trademark Horizontally-Opposed Boxer engine technology – a key component of any Subaru – and will reinterpret the enjoyable, sure-footed driving experience in a rear-wheel drive format. For the first time in Europe, show-goers will also be able to see the Subaru BOXER Sports Car Architecture Concept in the metal. The first concept to be released under Subaru’s new international brand strategy of ‘Confidence in Motion’, the concept is designed to show the possible design direction for future Impreza models. Expressing Subaru’s core brand value of ‘enjoyment and peace of mind’, the new Concept offers a sleek and lean form that exudes dynamism and elegance. It also features a spacious and plush four-seater interior, and promises an engaging yet safe and comfortable ride. Measuring 4,520mm in length, 1,820mm in width and standing 1,430mm tall, the concept model features a new generation 2.0-litre, four-cylinder, Horizontally-Opposed Boxer engine paired with a Lineartronic (CVT) transmission. The new Subaru Trezia will also be on display. The left-hand-drive-only B-segment vehicle is designed to meet the increasing demand for small, environmentally friendly cars in Europe. The ‘Compact Smart Wagon’ comes in at under four metres and offers remarkable levels of interior space. A 1.3-litre petrol and 1.4-litre diesel (with CO2 emissions of 113 g/km) will be on offer, and although only available in left-hand format, plans to study the development of a right-hand drive version for possible introduction to the UK are currently under review. 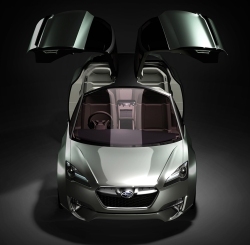 For more information on the Subaru ‘BOXER Sports Car Architecture’ Concept please log on to http://www.subaru-global.com/boxersports.html.